March 22, 2019 | Filed under: Current Articles,Featured | Posted by: Alex A.
Ryan Cottingim trains a diverse group of open horses and Non Pro riders at every level. He describes his program as being fundamentally and mechanically based. Repetition and routine are his keys to starting young horses on poles, and that foundation is something he can always return to at any point. He has no problem taking a horse right back to step one – the single pole – whenever an issue might pop up. 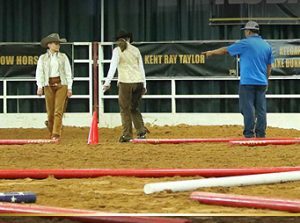 Ryan assesses each young Trail horse individually to determine when they’re ready, saying, “I will start them over poles when I have some body control, some foot control, and some shape or collection. I’ve started some young two-year olds that weren’t necessarily at show speed yet. They weren’t going slow with their heads down, but they were strong enough mechanically to start teaching them the fundamentals of going over the poles.” On the other side, he’s introduced poles to horses that have already had a successful Western Pleasure career. In those cases, “they may have their show speed and their head low, but we still need to teach them a different type of body control before we can go over poles.” At either end of the spectrum, his ideal is to start with a very fundamentally grounded horse, in terms of body control and foot placement, before introducing a new set of cues and a change in stride. He reasons, “A two- or three-year-old has been taught to be comfortable at a certain stride for Western Pleasure, Horsemanship, or even Hunter Under Saddle. He’s been conditioned to do another event. His education tells him that he’s not supposed to take a six-foot stride at the lope or have a three-foot trot. Maybe he’s Hunter-bred and his stride is a little too open.” Ryan employs patience and understanding to move the horse into a zone where he’s comfortable with the stride collection and extension that’s needed for Trail. He also makes it clear to the horse that it’s still okay to have that shorter stride for other events and to be comfortable with a longer, more open stride as well. Click the link below to read more from Ryan Cottingim, Tim Kimura, and Jason Gilliam.